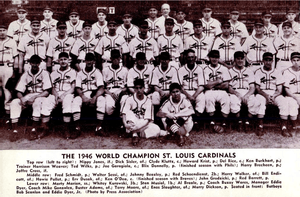 The 1946 St. Louis Cardinals season was a season in American baseball. It was the team's 65th season in St. Louis, Missouri and the 55th season in the National League. The Cardinals went 96–58 during the championship season and finished tied with the Brooklyn Dodgers for first in the National League. St. Louis then won a best-of-three playoff for the pennant, 2 games to none. In the World Series, they won in 7 games over the Boston Red Sox. They won on Enos Slaughter's "mad dash" that gave them a 4–3 lead in the 8th inning of game 7. Prior to 1946 season: Solly Hemus was signed as an amateur free agent by the Cardinals. First baseman Stan Musial won the MVP Award this year, batting .365, with 16 home runs and 103 RBIs. July 1946: Jim Gleeson was traded by the Cardinals to the Boston Red Sox for Don Lang and Bill Howerton. Stan Musial, National League leader, Triples, (20).